The best outdoor security lighting does more than just keep your home or property safe from criminals. Great lighting can also help you navigate safely around your property in the evening, prevent nocturnal animals from meddling in your trash, and so much more. Use them to light up walkways, stairways, and other potentially hazardous areas. These lights are triggered by movement, so any time there is something that needs to be seen, it will be. There are tons of LED security lights on the market today, so we’ve reviewed the best of the best, and found 10 that are perfect for your property. Take a look at these contenders. These 10 security lights are the best options on the market today, offering a wide variety of features to suit your property. Here’s a side-by-side comparison of their most notable features. RAB Lighting Super Stealth 180 degrees out, 360 degrees down Advanced detection feature minimizes false triggers Check on Amazon! MAXSA Motion-Activated Dual Head Solar Security Light 180 degrees Adjustable sensor settings Check on Amazon! First Alert PIR725 Motion-Sensing Light Socket 360 degrees Indoor use Check on Amazon! Hyperikon LED Outdoor Flood Security Light 150 degrees Rated to withstand the harshest weather and temperatures Check on Amazon! 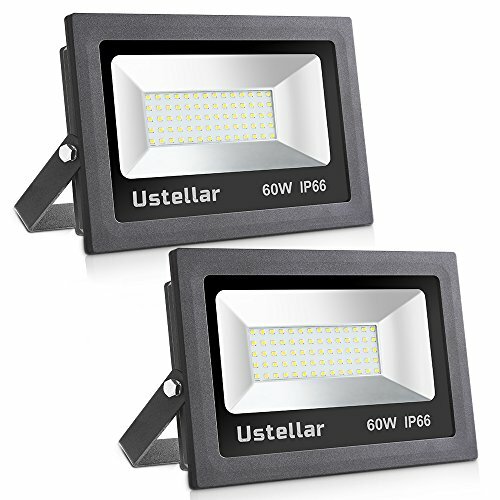 Ustellar 60W LED Flood Light Not motion activated Incredibly bright Check on Amazon! 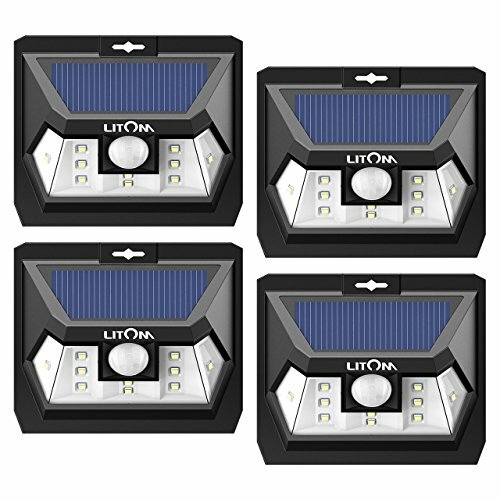 LITOM Solar Lights 180 degrees 20% higher sensitivity than most outdoor security lights Check on Amazon! LEPOWER Solar LED Security Light 180 degrees Does not need direct sunlight to charge Check on Amazon! 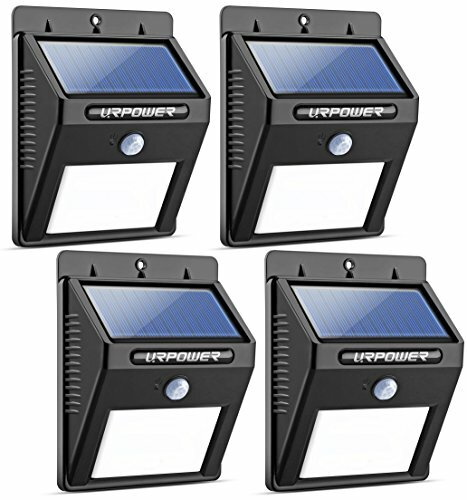 URPOWER 8LED Solar Lights 120 degrees Brighter and more durable than other models thanks to custom internal circuitry Check on Amazon! 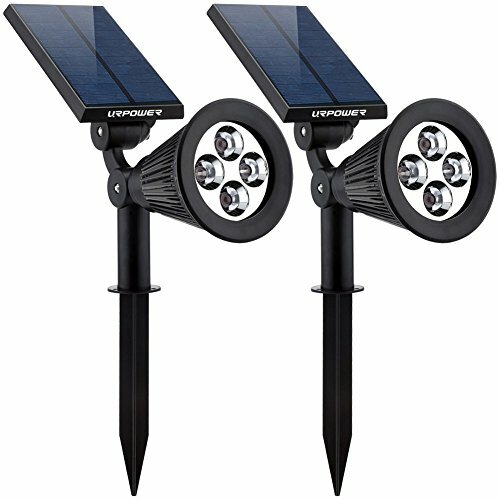 URPOWER 2-in-1 Waterproof Solar Lights Not motion activated In-ground lighting that can also be used on walls Check on Amazon! 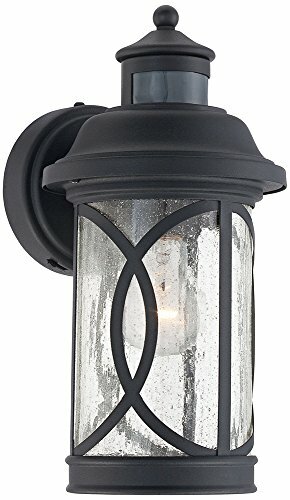 Capistrano 12 3/4″H Black Motion Sensor Outdoor Wall Light 220 degrees Stylish design Check on Amazon! Now let’s take a look at each of these security lights in-depth. These are the top 10 best outside security lights or flood lights on the market today, based on a wide range of factors. Below the reviews, you’ll find details on how we chose the best of the best, and how to shop for LED security lights. Featuring one of the widest detection ranges of all the security lights we reviewed, the RAB Lighting Super Stealth offers the best coverage for your property. This makes it ideal for securing commercial property or any area where safety is a must. The feature that really makes this light stand out is the shielded circuitry, which means that it is totally immune to all radio frequencies. Power surge protection is also a high priority for this light, with 6,000 volts of surge protection. Like all of the top LED lights that made this list, it is an extremely durable model that offers great performance. The lighting is enhanced by 1,000 Watts of switching capacity, and the entire fixture has a manual override and auto reset so that it stays reliable when you need it. It also has a great power rating to conserve energy and provide you with plenty of illumination. Need to ensure that your security light is extremely sensitive when you’re not home, but maybe not so sensitive when you are there? The MAXSA Security Light is a great choice. 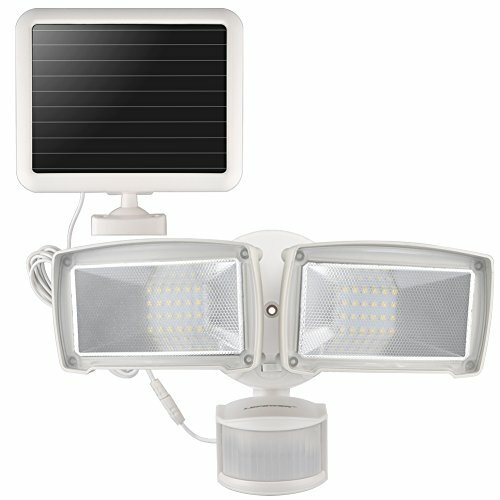 Most outdoor LED lights that are motion activated have adjustable sensors, but this model allows for quite a lot more adjustment than is common. You can choose the sensitivity so that you are in control of when the light comes on, based on your needs. This is an entirely solar-powered light, so there is no need for an electrician to install it, and the LED bulbs last a lifetime. You can also reposition the heads to illuminate the areas you need the most lighting. Light up a pathway, illuminate the doorway, make a dark area of the yard brighter, or light up the tree that makes your driveway tricky to navigate. Whatever you need to spotlight, you can. Need a motion-activated LED security light for indoors? 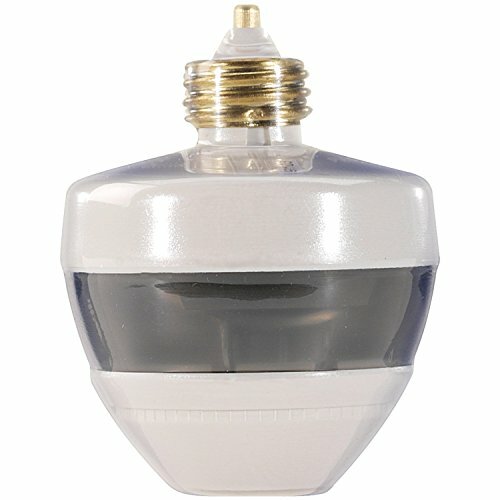 You can light up the garage, stairways, the basement, the attic, a dark hallway, or any area in your home with the First Alert Motion-Sensing Light Socket. This is a very versatile option for lighting up an indoor area, and screws right into a standard light bulb fixture. Use it in a shed, storage unit, or other work space to ensure you always have adequate light. It offers 360-degrees of motion sensing and comes at an affordable price. This light bulb is long-lasting and can also be used in protected outdoor bulb sockets. If you have a lighting fixture on your porch with a shield, for example, this bulb could be used outside without worrying about weather damage. Do you need outdoor security lighting that can stand up to any type of weather? If you liked the idea of a light that can work outside, but you worry about heavy rain or even tornado winds damaging your security fixture, here’s a great option. The Hyperikon LED Outdoor Flood Security Light is a waterproof fixture that is fully resistance to shocks and vibration. Once you install this light, it’s not going anywhere. It offers an extremely bright light for 45,000 hours before the bulb needs changing, and the sensor can be set to three different modes to make it perfect for your needs. 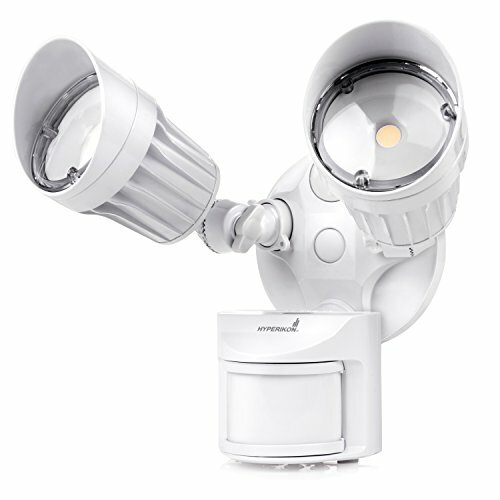 It’s a perfect security lamp for any property where the weather is not predictable. The light is a concentrated beam that illuminates a specific area, so you can set it to exactly the area where you need light the most. There are certain areas where you may want continuous security lighting all through the night. In that case, you can find more affordable security lights that don’t have motion detecting sensors, such as the Ustellar 60W LED Flood Light. This lamp offers incredible brightness, making a dark area look as well-lit as it would be during the daytime. This offers great security for a public space, like a storage unit facility or a park, where continuous lighting is needed for the best safety. This light does have a great lifespan as well and uses less energy than similar models. You can also outfit it with sensors and dimmers if you want to convert this light to a motion-activated security feature. This makes it a very versatile option for a property owner that needs security lights to do different things in different areas. If you’ve ever had issues with an LED security light that didn’t come on as quickly as you’d like it to, you’ll appreciate the LITOM model. It has an extremely sensitive motion detector, which will brighten in under 20 seconds so that you have full light the moment you need it. Rather than turning off all the way when there is no motion, this light maintains a constant dim light all throughout the night, and simply brightens to full power when there is motion. This means you can easily navigate at night even if the sensor doesn’t see you. It turns off when the sun rises to save power and prevent pollution. It’s perfect for the porch, the walkway, the pool area, or other places where you may want to have extra safety. It also helps to eliminate the common problem of constant lighting not deterring criminals – the sudden brightening will act as a deterrent. One downside to many outdoor security lighting fixtures is the fact that they need a good amount of sunlight to stay charged. If you have a porch or walkway that is shaded by a tree or an overhang, you may find that a solar-powered light isn’t as powerful as you’d hoped after a year or two. Not so with the LEPOWER model, which can be fully charged even in the shade or on overcast days. It is also very durable against the elements and offers plenty of coverage and motion detection to make it an excellent option for outdoor security. It offers 50,000 hours of operation, which means you can run it non-stop for more well over five years without worrying about changing the fixture. This is a very solid, dependable light if you can’t always count on full sun. When it comes to outdoor motion sensor lights, you often have one of two options: you can get a light that is extremely bright, or you can get a light that offers great energy conservation. The URPOWER 8LED model offers a great middle ground between the two. This light is both bright and conserves energy, with a 120-degree sensor when you want the light to be automatic, as well as a continuous lighting mode. It can be installed anywhere, and you don’t need to be an electrician to get started. Just place it where you want the light and it will begin operating as soon as it charges from the sun. This works great if you want the most reasonable option for your money and don’t need the brightest lamp in the world for your security needs. Need solar-powered lights that can light up a walkway? This option from URPOWER is designed to be planted in the ground, similar to other lawn torches, but can also be installed anywhere you need it to be thanks to the customizable design. What really sets this light apart is the fact that the lamp and the solar panel can both be rotated on the spike, so that you can catch the sun and direct the light in the way that works best for your property. The LED bulbs and the solar panels are both larger to provide more and brighter light, and they can be used year-round. These are also designed to be resistant to shocks or vibrations, meaning that if you accidentally trip over one, it won’t turn off – a common problem for in-ground security lamps. Looking for a more stylish option for your home security? This outdoor security lighting fixture looks like a decorative iron lantern, blending in with the classy design of your home or property. It offers 220 degrees of motion detection, which is quite a lot compared to many other outdoor options. As with all the best security lights, it is long-lasting, weather-resistant, and easy to install. The beautiful design of this option makes it very popular for upscale businesses and residences. It works well on a porch, in an entry-way, beside a garage door, or even hanging on a shepherd’s hook. If you have stayed away from security lights before to avoid the look of commercialized fixtures, this is the perfect compromise to keep you safe and enjoy the appearance of your property. Fixtures that can be installed anywhere. You need security lights to illuminate the areas where normal lights don’t reach. This often means that you need to be able to install and aim lights in hard-to-reach or awkward areas, where there aren’t power outlets to plug in a typical light. That is why solar-powered or battery-powered lights are popular for this function. We looked for lamps that were durable against the weather so that they could be put in exposed areas outside, as well as lamps that offered multiple options, such as ground stakes and hanging details, so they could be used in many ways. Fixtures that offer multiple lighting timer options. Motion-sensing lights that only turn on when there is movement outdoors can be fantastic for a number of reasons. However, some property owners want the option to have light on all night long. Many of the lights we reviewed offer both – a dusk-to-dawn mode, as well as a motion-sensing mode. This allows for extra security and lighting when you want it, and less when you don’t need it. Fixtures that are stylish and blend in with the look of your property. Security lighting is often a utilitarian feature that is meant to stand out – giving would-be criminals the heads up that they are being watched. However, many property owners want lights that still look nice when added to their home or building. Fixtures with easily-operated controls. Manual switches that allow you to change the settings on your outdoor LED lights are the best overall, because they are easy to understand and use. This is important for homeowners that want to just set their lights at the right setting and go on with their day. Fixtures that are energy efficient. This is a very important feature for outdoor lights, because you don’t want to have to worry about replacing bulbs. Most LED lights made for the outdoors offer anywhere between 20,000 to 50,000 hours of use. If you were to run the bulb consistently at full power for that long, that is nearly six years of use – however, these bulbs are generally only operated in the night time hours, so you can expect nearly double that in the bulb’s lifetime. The more energy efficient the bulb is, the closer to 15 years or more you can expect from a single light. Whether your goal is to use these lights for deterring criminals, or to make your outdoor spaces easier and safer to navigate in the dark, there are many ways that you can optimize your use of these lights. Here are a few tips for getting the most out of the best outdoor security lights on the market. Position the lights in a way that avoids creating blind spots. Try to aim the lights so that you light up the largest area and overlap lighted areas to prevent blind spots. One super-bright light won’t be as effective as a handful of dimmer lights, simply because it can’t be aimed in all directions at once. Many of the lights we reviewed offer multiple heads, so that you can point the lights all around with just a single fixture. Don’t forget about lighting the sides and back of a property for security. When you are thinking about using lights like these for safe navigation, you often focus on the front of the house – where you’ll be walking in from your car. But for security’s sake, don’t forget to light up the sides and back yard as well. These are the most common areas for burglars to approach a house. Put the lights up as high as you can, so that they cast a larger radius of light. The closer to the ground the light is, the smaller the circle of light will be. However, try to strike a balance between a large circle of light, and brightness. If you put the light up too high, the light may not be powerful enough to illuminate all the way to the ground. You may need to try out a few different placement options till you find the right balance. Another reason to have your lighting up higher than you can reach when standing is to prevent criminals from tampering with it. Solar-powered lights have the advantage of being disconnected from power lines, so the lighting can’t be “cut”. And if you place the lamp up high enough, they can’t be removed or tampered with. Be sure that you are able to perform regular maintenance on your lights. These lights do offer thousands of hours of run time, but that doesn’t mean they won’t need a little bit of routine maintenance. You may need to wipe the lens clean, keep leaves and other debris off the unit, or adjust the light to point in a better direction – not to mention you may need to change the setting if you plan to be gone for a time. So be sure that you check the light routinely and that you keep it clean and well-maintained. Angle your lights away from the homes of your neighbors. There are quite a few reasons to do this, but let’s talk about the most important two reasons. The first reason is, of course, to avoid aggravating your neighbors! But the second reason is actually to improve security. When bright lights are glaring into your neighbors’ eyes, they will actively look away from your house to avoid hurting their eyes. This allows burglars to go unnoticed, even though you have security lighting. Use bulbs that offer white or natural lighting. Colored lights aren’t the best for security purposes because they can distort the way a person looks. If asked to describe clothing or appearances, the colored lighting will make the details different. Consider the fact that motion-sensor lights are more useful for scaring away trouble. It’s a common thing to want lights on at all times around a property, because it makes us feel safer. But it also allows criminals to see what they are doing. Motion-sensor lights, on the other hand, not only blind the criminal momentarily when their eyes are adjusted to darkness, but they also spook someone. They can’t know if their presence was detected and the light was thrown on by a person, or if the light activated a camera, or alerted neighbors. They are far more likely to bolt due to a light suddenly appearing. You’ll see in our reviews that most of the lights we deemed the best on the market are either wall-mounted or ceiling mounted lights. These offer the best versatility over all. However, there are quite a few types of lights, and you may want to consider combining some of these lights with others that work better for your property. Take a look at the following types of outdoor security lights. Wall lights: These can be mounted anywhere that you have a vertical surface. They are perfect for areas where the typical light won’t reach, or in areas where you don’t have power outlets to add lighting. Walkways, porches, garages, sheds, or any other walled-in area can have this type of lighting installed. Post lights: These are lights that can either be hung from a post (like a shepherd’s hook) or come with their own post attached that can be planted into the ground. These are great for creating a lighted walkway, or for illuminating an area slightly away from a building. You can place them at the foot of porch stairs, for example, to create an ambient glow that makes the stairs safer. Ceiling lights: These are lights that are mounted to the ceiling, casting light downward. They tend to offer the largest circle of light for a whole space, because they have the most open or clear surface area. This is a really good option for over a doorway or inside a small shed. You can also find these built-in to ceiling fans, for porches or outdoor gazebos. Landscape lighting: Similar to post lights, these are short lamps that are staked into the ground and offer light just along a walkway. They don’t tend to be bright enough to illuminate a whole space – rather, they just make it easy to see the path. These are often used to spotlight special landscaping features for aesthetic purposes as well. One reason that many property owners like motion-sensing lights, and lights that cast illumination downward, is that it can help reduce light pollution. Street lamps, and constantly-lit fixtures that aim their light in all directions (especially upwards) add to light pollution. This has many harmful effects on nature, including disrupting bird migration. You may see certain outdoor security lights as being reviewed by the Dark Sky movement, or the Good Neighbor movement, both of which are seals of approval stating that the light has a smaller impact on pollution. Using smart technology like a timer or a dusk-to-dawn feature is a big part of helping reduce pollution. 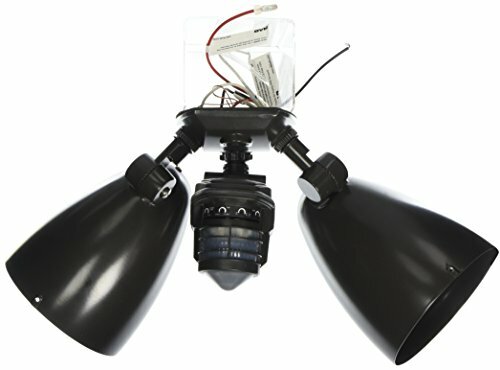 The best security lights on the market today are those that offer dependable function, versatile settings, weather-resistance, and unique styling. These 10 are the best options on the market today, offering everything you need to keep any property safe, secure, and easy to navigate. The best way to use them is to combine lighting fixtures so that you have lights in all the shaded areas of a property. Use the tips in this article to make your property safer, and to have a lovely ambience when you need to walk inside after a long day or night.